Officially endorsed by the RAF's leading welfare charity; the Royal Air Force Benevolent Fund, comes a new documentary celebrating a century of the Royal Air Force. Including extraordinary and unseen historical footage of WW1 and WW2 and narrated by Sir Martyn Lewis. 100 Years of the RAF is a definitive film that pays tribute to the determination and courage our men and women take on in the theatres of war; to defend our freedom and bring relief to people in need. Produced and Directed for Forces TV by Andromedia and in association with Octopus TV. 100 Years of the RAF is produced by Richard Jukes of Andromedia with Richard Jones of Forces TV. Narrated by Sir Martyn Lewis. 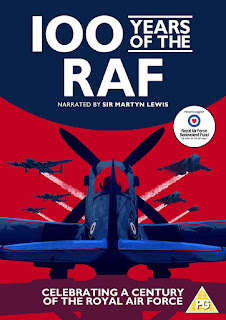 Signature Entertainment presents 100 Years of the RAF on DVD & Digital HD from 4th June.